For years, owners of early Z-cars with lowered suspension and wide tires have struggled with the lack of power steering options for the 240Z / 260Z / 280Z. Lots of classic Z folks will say, “It doesn’t need power steering” or “Man up and drive.” Well, here’s the deal – With an RB swap in our Z, and aftermarket big brakes, it goes and stops with precision. The gas pedal is responsive and light. The clutch pedal is light and easily modulated. And the brakes are similarly “easy”, considering the large calipers and oversized booster and master cylinder. So, this results in some disparity in driving – Your feet are taking a light, precision approach to the pedals, while you’re manhandling the wheel. Steering at slow speeds is almost overwhelmingly heavy – and that’s with a stock-diameter steering wheel. You can forget putting a smaller-diameter wheel in there. Further, I built this Z for my wife to drive. So, the “man up” crowd can zip it. Besides, most of the naysayers are still toodling around on 4″ skinny tires, stock brakes, and 120 horsepower… “Man up” indeed. With more than 300-hp on tap, her Z needed a modern steering solution. Regardless of whether you think the Z would benefit from power steering or not, there’s simply not a lot of options out there. There had to be a better way – what about all the hot rods out there? As is the case with many of our product review articles, we ran across a company at the SEMA Show in Las Vegas. They were displaying their electric power steering systems for classic musclecars. I spent quite a bit of time chatting with Geoff about cars, specifically modern upgrades to classics. During this conversation with Geoff, I couldn’t help thinking that this would be a perfect solution to the steering issues on our Z project. One thing led to another, and before long, plans were laid for a power steering system to market specifically to the Z-car crowd. A few weeks and several measurements later, the prototype kit was completed. First of all, no major modifications are made to your vintage Z-car… Everything is designed to be located under the dash and is almost completely invisible. That’s a definite plus, considering some of our early Z’s are really climbing in value. Also, the 45-amp system will function with a standard Z alternator – although, for the early Z, I’d highly recommend upgrading to a more modern 60-amp alternator, which is easily accomplished with the help of our friends at Motorsport Auto: Datsun 240Z / 260Z alternator upgrade. This system retains the original steering ratio, as designed by Datsun. It’s silent, maintenance-free, and can’t leak! Lastly, and perhaps most importantly, the system allows for full adjustability of assist – You may prefer a little less assist, while your spouse may like to dial it up a bit. Another benefit is that it senses steering input torque so that it’s not over-boosting your steering effort. We’ll discuss that a little more later. Installation is super-simple. I completed the install in about two hours with a helper, and basic hand tools – and I did it without an instruction manual. Here’s how it goes… First, you’ll want to open the hood and disconnect the battery. Get the front end up on jackstands so that the front wheels can move freely (make sure to put the key in the ignition). 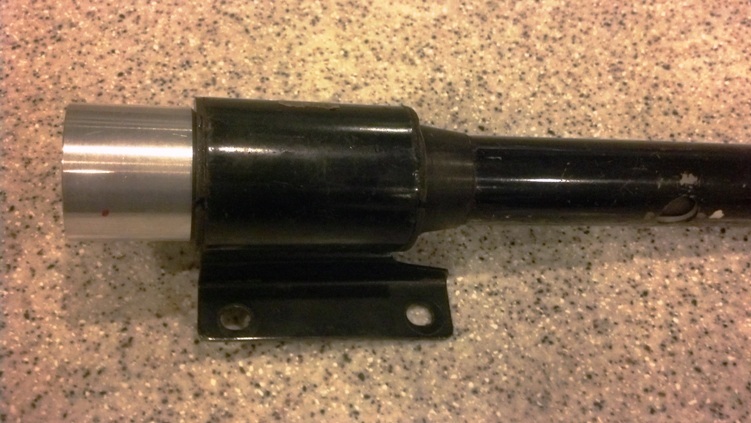 Disconnect the “rag joint” on the steering shaft under the hood. This is a great time to ditch that old, crunchy rubber biscuit and replace it with a new bushing. Set the hardware aside for now. Remove the plastic clamshell from around the column, revealing the ignition switch. Be gentle, these are usually old and brittle by now. Disconnect the plugs for the ignition switch, light switch, horn and turn signal switch from the column. Now is a good time to add some dielectric grease to the plugs, so that they’re protected and easy to disconnect in the future. Remove the four bolts in the square plate securing the steering column to the firewall, and set these aside as well. Remove the four bolts that go through the steering column yoke up into the metal frame of the dash (2 bolts if you have a 280Z). Be careful, don’t let the column fall down and nail you in the head… not that it’s ever happened to me – Ouch. 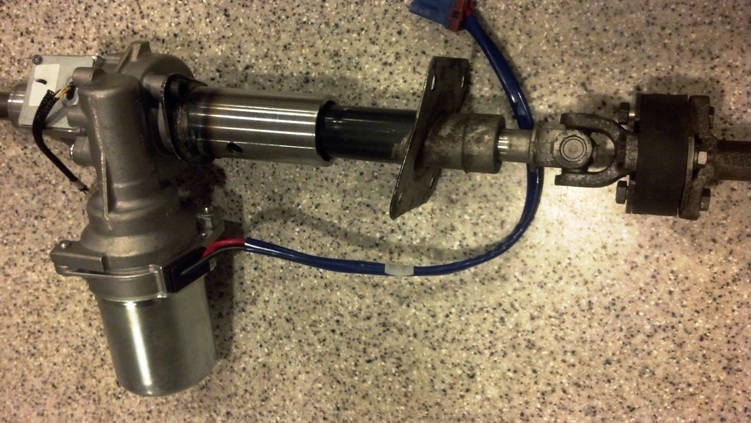 Gently remove the steering column from the car and set it aside. Installation is the reverse of removal – Orient the electric motor to the right side of the column (over the gas pedal) and maneuver the joint at the end of the column through the hole in the firewall… This is where it helps to have an assistant guide the joint through and align it with the steering shaft in the engine bay. Loosely reassemble the rag joint (preferably with a new steering bushing), and go back to the interior. Lift the column up into place, and loosely install the four bolts holding the steering plate to the firewall. Now, loosely install the four bolts that secure the steering column to the dash frame. Once the column can be raised up to its highest point, you can start tightening the hardware (floorboard, rag joint, and column-to-dash). Again, at this point, the weight of the electric motor will cause it to want to pivot downwards – Have a helper hold it up, tucked tightly under the dash, OR, you can do as I did and use a bungee cord to hold it in place while I tightened the hardware. Go ahead and plug in your electrical connections (headlights, horn, turn signal, ignition), but hold off on reinstalling your steering wheel for now. You’re done with the mechanical parts of the install! Take a break and we’ll get started on the wiring. The wiring harness is already preassembled. You’ll find the “brain box”, (with a mounting bracket included), the potentiometer, and the harness itself. Find a convenient location on the firewall to mount the brain box, so that you can access the openings for the plugs. Since mine was the prototype, I made a mounting bracket using a small length of punched steel strap. Bent it around the box with an inch sticking out on each side, and fastened it to the firewall, way up high, behind my gas and brake pedal. You’ll want to mount yours directly to the firewall, with good metal-to-metal contact. This is important! Then, you’ll want to find a place to mount the potentiometer. The potentiometer is an adjusting device that allows you to increase or decrease power assist, based on your preferences. As such, you’ll want it mounted in an easily-accessible location. I decided to make things easy on myself – I removed the cigarette lighter and mounted the potentiometer there. This placed it in easy reach. As far as the cigarette lighter, I’ll be wiring in a nice 2-port charging receptacle later, likely below the dash on the passenger side. This will allow charging of a cell phone and occasional use of a radar detector or other electronics. Now, let’s hook up the harness wires. NOTE: The prototype system had separate wires for power, ground, and an on-off switch. Our new systems are much simpler, with only a power wire to connect! The small black wire goes to the ground tab on the on/off switch (it’s the one that’s offset a little bit), and the small red wire goes to one of the other terminals on the switch (top or bottom). Lastly, you’ll run a 12v wire to the other terminal on the switch – This wire should be connected to a location that is “hot” with the ignition on. The installation really is a no-brainer. Even with this being the prototype version, everything lined up nicely and looks very professional – Almost OEM in appearance! Let’s talk about safety. 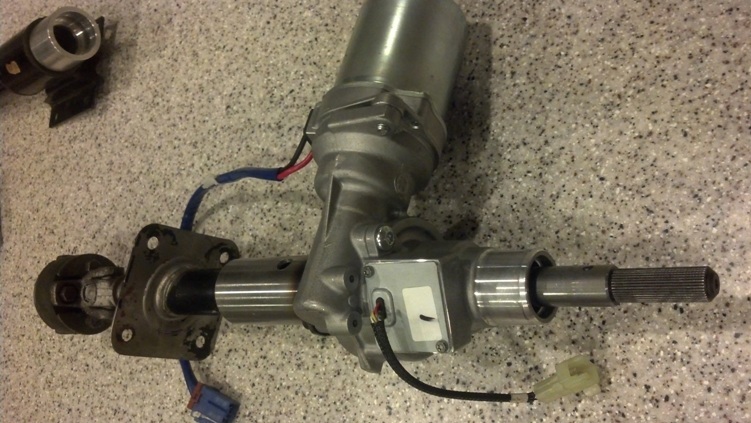 During the development of this kit, I had a couple people ask me, “What happens if the electric motor fails? You’re gonna have no steering!” … Well, no. In fact, if the electric power steering system ever failed (highly unlikely), the car would steer exactly like it did prior to the power steering conversion. However, if your hydraulic power steering system fails, the steering instantly becomes extremely heavy, and potentially dangerous. So, let’s rehash the benefits of this setup: Smooth, responsive steering feel, none of the steering shudder or intermittent pulsing that you get from an older hydraulic system, less strain and drag on the engine, no hydraulic lines or power steering fluid to deal with, and a clean, uncluttered engine bay… all this for the cost of a new set of wheels. 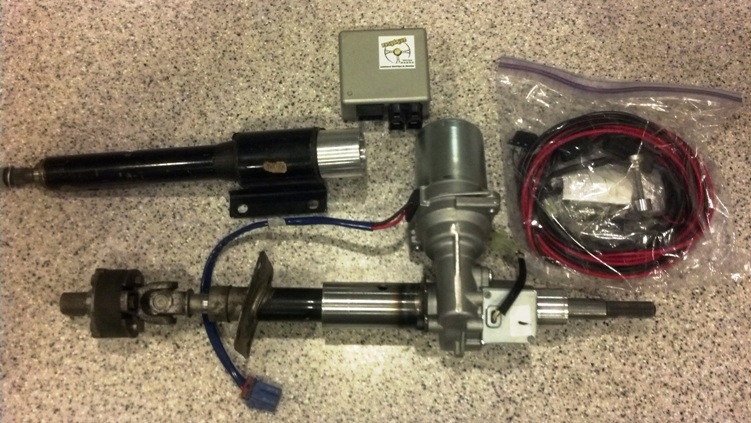 To purchase a power steering upgrade for your classic Z, contact us at Z Power Steering! For more helpful articles on the 240Z / 260Z / 280Z, please visit the Datsun Z Technical Discussion Forum, or the Datsun Z General Discussion Forum!